Oscar Week: Slumdog Millionaire (Ryan’s Take) | Critical End! This entry was posted on Sunday, February 22nd, 2009 at 5:19 pmand is filed under . You can follow any responses to this entry through the RSS 2.0 feed. Both comments and pings are currently closed. I couldn’t agree more. I loved this movie. 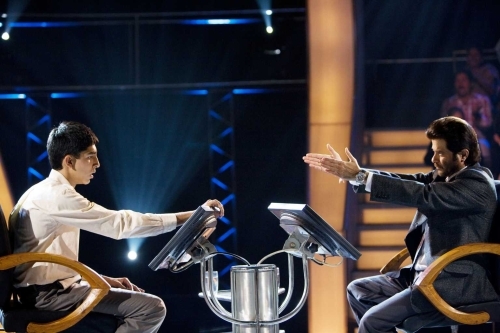 As a writer, I myself fancy a great story and I think Slumdog Millionaire was just that: An pretty well-told great story. There will always be a place in my heart for campy horror films, foul-mouthed comedies, crazy-awesome action films with over-the-top effects, and—though I hate to admit it—the occasional predictable romantic comedy, but when the story itself is able to make me think and to move me, I feel like I’ve gotten back to cinematic basics. When a film can prove to me that you don’t need a roster of high-profile celebs or a ton of special effects to have a great theater experience, simply because the film tells a great story, I always walk out of the theater with that much more respect for the film. Which is exactly what happened after seeing Slumdog. Yeah, that’s the thing, Dave, The Wrestler didn’t make the list and I was only considering movies that did. In reality I’d put WALL-E in the running too. But you’re right, I have not seen The Wrestler and really need to. This movie did change my life (no longer pimping child-beggars) but most importantly, I think it captured some grit and reality from India. The kids actually came from the slum pictured which is where the a large portion of Indians live. This film made a lot of people happy for telling a portion of their story. Their celebration after the Oscars was uplifting as well.